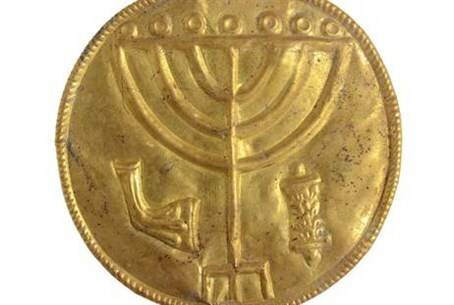 In summer excavations at the foot of the Temple Mount, Hebrew University of Jerusalem archaeologist Dr. Eilat Mazar made a stunning discovery: two bundles of treasure containing thirty-six gold coins, gold and silver jewelry, and a gold medallion with the menorah (Temple candelabrum) symbol etched into it. Also etched into the 10-cm medallion are a shofar (ram’s horn) and the image of a Torah scroll. The medallion may be the oldest Torah ornament ever found in archaeological digs. The discovery was unearthed just five days into Mazar’s latest phase of the Ophel excavations, and can be dated to the late Byzantine period (early seventh century CE). The gold treasure was discovered in a ruined Byzantine public structure a mere 50 meters from the Temple Mount’s southern wall. The menorah, a candelabrum with seven branches that was used in the Temple, is now the national symbol of the state of Israel and reflects the historical presence of Jews in the area. The position of the items as they were discovered indicates that one bundle was carefully hidden underground while the second bundle was apparently abandoned in haste and scattered across the floor. Given the date of the items and the manner in which they were found, Mazar estimates they were abandoned in the context of the Persian conquest of Jerusalem in 614 CE. After the Persians conquered Jerusalem, many Jews returned to the city and formed the majority of its population, hoping for political and religious freedom. But as Persian power waned, instead of forming an alliance with the Jews, the Persians sought the support of Christians and ultimately allowed them to expel the Jews from Jerusalem. Hanging from a gold chain, the menorah medallion is most likely an ornament for a Torah scroll. In that case it is the earliest Torah scroll ornament found in archaeological excavations to date. It was buried in a small depression in the floor, along with a smaller gold medallion, two pendants, a gold coil and a silver clasp, all of which are believed to be Torah scroll ornamentations. “It would appear that the most likely explanation is that the Ophel cache was earmarked as a contribution toward the building of a new synagogue, at a location that is near the Temple Mount,” said Dr. Mazar. “What is certain is that their mission, whatever it was, was unsuccessful. The treasure was abandoned, and its owners could never return to collect it." The Ophel cache is only the third collection of gold coins to be found in archaeological excavations in Jerusalem, said Lior Sandberg, numismatics specialist at the Institute of Archaeology. “The thirty-six gold coins can be dated to the reigns of different Byzantine emperors, ranging from the middle of the fourth century CE to the early seventh century CE,” said Sandberg. Found with the coins were a pair of large gold earrings, a gold-plated silver hexagonal prism and a silver ingot. Remnants of fabric indicated that these items were once packaged in a cloth purse similar to the bundle that contained the menorah medallion. Mazar’s Ophel excavation made headlines earlier this year when she announced the 2012 discovery of an ancient Canaanite inscription (recently identified as Hebrew), the earliest alphabetical written text ever uncovered in Jerusalem. The 2013 excavation season at the Ophel ran from the middle of April to the end of July, on behalf of the Institute of Archaeology of the Hebrew University. The Israel Antiquities Authority is carrying out the preservation works, and is preparing the site for the public.